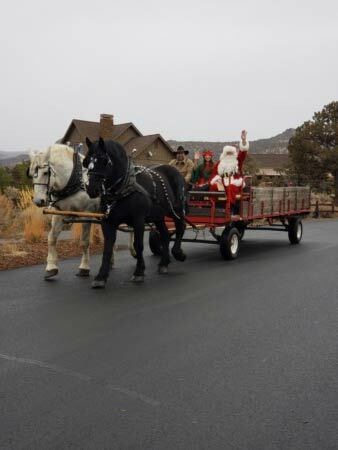 The Club at Brasada Ranch is coming off an incredibly exciting holiday season where many, many fond memories were created by all of our wonderful Members and their families over this special time here at The Ranch. Beginning with the Thanksgiving holiday this was the first year that there were three separate dining options to fit everyone’s desires and needs to create a delightful Thanksgiving dining experience. Following a beautiful meal with all of the trimmings Santa Claus made his very first appearance on Black Friday as he visited with all of the children during a bountiful breakfast. Children from all over the property came with excitement in their eyes as they saw Santa and let him know what they had been dreaming about for months! The day was culminated by the traditional lighting ceremony of the Brasada Christmas Tree and cookies and milk with Santa. The week of Christmas was abuzz with activity and the traditional Brasada Christmas Brunch was a sold out affair. Throughout the week there was a plethora of exciting family activities including the Lil’ Wranglers Holiday Ho Ho Hoedown to give all of our little wranglers the opportunity to participate in themed activities, games and crafts. Following the excitement the children were treated to dinner and a S’mores roast by the camp fire outside of The Hideout! The 2018 holiday season concluded with a signature “Great Gatsby” New Year’s Celebration! Harkening back to the roaring 20’s The Barn at Brasada was elegantly staged with glitz and romance that provided for a lavish soiree to ring in 2019! Complete with prohibition cocktails and hors d’oeuvres provided by Chef Doug the night was a staggering success that was enjoyed by our Brasada Members and Guests alike.